While we wait for definitive reports, we checked in with six nonprofit leaders to talk tax reform. They discussed their 2018 fundraising performance, whether they think tax reform played a role, and what else may be influencing giving to their organizations. Below, we shared key themes from those conversations. Scroll to the end of the article for a full list of our interviewees. Some organizations saw decreases in certain giving levels, while others posted across-the-board increases. Fundraising results varied widely among the six nonprofit leaders we spoke with and the organizations they represent. The Nature Conservancy – California, Pasado’s Safe Haven, and Trinity Repertory Company all recorded robust fundraising performance in 2018. For TNC-CA, the number of gifts both above and below $10,000 continues to increase each year—the organization did better in FY 2018 (which ended June 30, 2018) than in FY 2017, and it’s on track to match those results in the current fiscal year. Likewise, Pasado’s Safe Haven had a strong end of year, and Trinity Repertory saw an increase in both number of donors and the amount of money raised, when comparing November and December 2018 to the prior year. Notably, smaller dollar donors accounted for most of its growth in number of households. Hopelink saw giving in 2018 steadily continue to grow, but among annual donors not giving through donor-advised funds, total giving decreased from 2017 to 2018. At The Community Library, giving from November 2018 to January 2019 clocked in 9 percent above the prior year, but the organization saw a decrease in lower to mid-range gifts. For Feed More, December 2018 giving was about 10 percent below December 2017. When it comes to fundraising, strategy and individual circumstances matter just as much—if not more—than external forces like tax reform. Several of our interviewees speculated that tax reform may have impacted their giving numbers, but all acknowledged that it was impossible to tease apart the various forces that influenced charitable giving in 2018: the volatile stock market in December, the otherwise strong economy, and yes, tax changes. The Nature Conservancy – California acquired eight miles of coastal habitat through a gift from Jack and Laura Dangermond. Land acquisitions of this kind tend to rally other donors to give. Pasado’s Safe Haven was able to offer a larger-than-usual match challenge in November and December and experienced great success with the roll-out strategy it employed. Trinity Rep has been working to solicit more add-on donations to ticketholders at the box office point of sale—and has acquired more smaller dollar donors in the $10-$50 range as a result. Hopelink doubled its individual giving team in 2018 and has been able to conduct more outreach to all levels of donors. The Community Library wrapped up the community phase of a capital campaign in 2018. Smaller dollar donors may have opted to direct gifts to the campaign at the end of the year rather than to the annual fund. 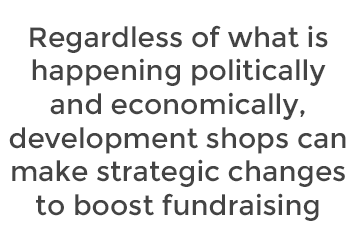 These pivots and individual circumstances underscore an important point: regardless of what is happening politically and economically, development shops can make strategic changes to boost fundraising. Smart investments in staff and technology, well-executed plans, compelling messaging, visionary leadership: all these elements can make a difference. At the same time, Chief Development Officer Tim McDermott of Feed More shared that many other food banks across the country experienced year-over-year decreases in total giving at the end of 2018. It’s possible that tax changes—in conjunction with other external forces—are disproportionately impacting certain sectors and charitable causes. It may take one to two more years to understand the full effects of the TCJA on charitable giving. Although a partial picture of tax reform’s impact is beginning to emerge, some of the nonprofit leaders acknowledged that there may be a learning curve for donors. After doing their taxes under the new tax code for the first time, donors may change their giving habits in 2019 and beyond. Executive Director Tom Parrish of Trinity Rep has made a point to understand the thought process of major donors: “When I would do solicitations, I would ask people how they were thinking and feeling about tax reform and how it might impact them,” he explained. As 2019 marches on, organizations should continue to check in with their donors and monitor changes that might result after the 2019 tax season. Some donors may be bundling giving into donor-advised funds to get over the new standard deduction threshold. DAFs came up several times in these tax reform conversations. The Community Library saw a significant increase in gifts from donor-advised funds. Hopelink is also experiencing increased giving from DAFs. Vice President of Advancement and External Relations Jeni Craswell noted that the organization is receiving a greater volume of smaller DAF gifts. In the past, Hopelink often received gifts from donor-advised funds well above the $1,000 level. Over the past two years, however, the average DAF gift to Hopelink dropped 14 percent. In 2018, that meant many donor-advised gifts in the couple hundred-dollar range. 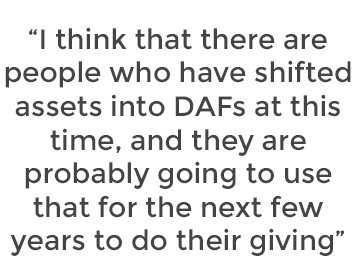 At Trinity Rep, Tom Parrish acknowledged that the organization had been experiencing a rise in DAF giving before tax reform, but in 2018, he observed certain major donors bundling their gifts into donor-advised funds to surpass the higher standard deduction threshold. “It doesn’t necessarily alter the stream of gifts to the organization; it’s just when the donor is contributing to their DAFs,” Parrish added. Our interviewees didn’t draw attention to tax changes in their year-end giving appeals. None of the nonprofit leaders we spoke with changed their end-of-year messaging in response to tax reform. For many of the organizations represented, this choice related to what giving motivations they wish to tap into. Development Director Mike Ritter of Pasado’s Safe Haven explained it this way: “If you’re talking about taxes, you’re immediately getting people to think about their take-home, which is the last thing you want people to do if you want them to make a gift.” Similarly, Carter Hedberg of The Community Library emphasized that his organization positions its mission and work as reasons to give, rather than tax benefits. Feed More also steered clear of invoking tax changes in its year-end appeals, but it plans to make a subtle reference in a March mailing: “As part of our recovery strategy, we are including two to three sentences that mention tax law changes in a spring direct mail appeal,” said Tim McDermott. Amid the uncertainty, there’s a strong sense that people are fundamentally generous. For the six nonprofit leaders we spoke with, the impact of tax reform is very much still up in the air. Despite the uncertain landscape, our interviewees spoke of the many reasons people give beyond tax benefits—and the generosity that drives donor’s giving decisions. 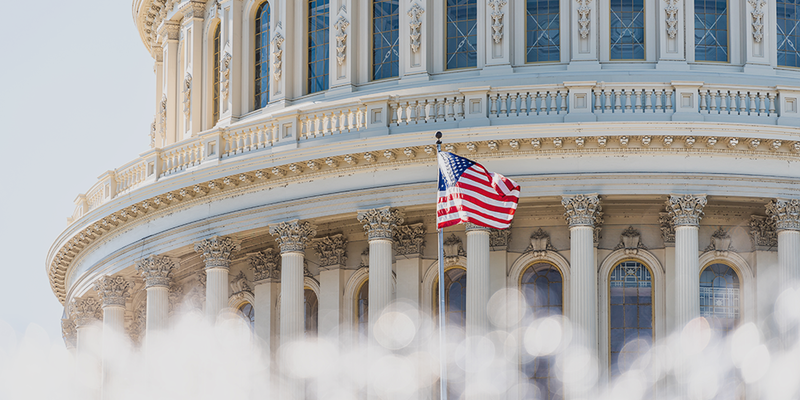 As 2019 progresses, we’ll learn more about the full effects of the Tax Cuts and Jobs Act. In the meantime, nonprofit organizations will continue to appeal to the diverse motivations of their donors, making a case for their vital work in communities across the country. Hopelink (Redmond, WA) serves homeless and low-income families, children, seniors, and people with disabilities in King and Snohomish counties in Washington State. They provide stability and help people gain the skills and knowledge they need to exit poverty for good. Hopelink’s programs include housing, transportation, family development, financial assistance, employment programs, adult education, financial literacy training, and food banks. The Nature Conservancy – California (San Francisco, CA) works to protect the lands and waters on which all life depends. It has protected 1.5 million acres of landscapes and 3.8 million acres of sea floor off the coast in California—habitats that are essential to the survival of nature and people. The Community Library (Ketchum, ID) reinvents the notion of what a library can be: it is a multi-faceted educational and cultural nonprofit institution for central Idaho. It is privately funded, but publicly minded, and last year the Library welcomed more than 125,000 visitors; circulated 117,613 items; and nearly 12,000 kids, teens, and adults engaged in free educational programs. Feed More (Richmond, VA) collects, prepares and distributes food to neighbors in need throughout Central Virginia. With a service area that stretches across 34 counties and cities, Feed More’s comprehensive programs and network of nearly 300 agencies help ensure communities have access to healthy meals year round. Rhode Island’s Tony Award-winning theater, Trinity Repertory Company (Providence, RI) bursts with activity that feeds the soul and inspires dialogue through unparalleled theatrical and educational experiences. Trinity Rep is proud to be a creative home for Rhode Island’s artists, audience, students, and community partners. In addition to investigating animal cruelty crimes and providing sanctuary and rehabilitation to animals who have suffered from abuse and neglect, Pasado’s Safe Haven (Sultan, WA) also advocates for better laws to protect animals and works to educate the public about how they can help end animal cruelty.